As most know A ROCHA has as characteristics of its identity the Christian motivation and a position of cooperation with other individuals or entities that share with us the nature conservation concerns. For several years A ROCHA, through its international team, has been in forums reminding Christians of the responsibility for caring for the environment as part of our citizenship and Christian Discipleship. 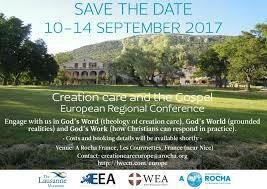 This time in cooperation with the European Evangelical Alliance and the Lausanne movement A ROCHA co-organizes the European Conference on Creation Care and the Gospel. It will take place between 10th and 14th of September at Les Courmettes, the A ROCHA France Centre, on the mountains overlooking the Cote d’Azur. This is a unique opportunity to learn from scientific researchers, Bible teachers, environmental educators and others. It is also an opportunity to meet other European Christians who share the environmental concerns and, above all, the love of God. For more information please visit http://lwccn.com/europe. I hope I get the chance to meet some of you there.